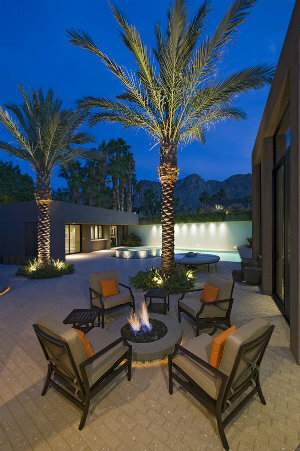 Known as the 'Beverley Hills of Palm Springs', Vista Las Palmas real estate has become a symbol of Mid-Century Modern design for discerning homeowners who want the relaxed style of the desert. Located just west of one of Palm Springs most classic neighborhoods, known today as 'Old Las Palmas' and just a 15-minute walk from Downtown, this neighborhood is the perfect balance between urban and suburban living. Celebrities were among the first to discover this neighborhood—removed enough from the big city but close enough to the studios, they could quickly return if needed, and soon Vista Las Palmas became one the world's most celebrity-packed neighborhoods. Adding to the understated glamor of this community, many of the Vista Las Palmas homes for sale have been featured in TV commercials, movie scenes, and photo spreads in architecture magazines. Start your search for the finest Palm Springs homes for sale below, or discover classic, small-town America living with Vista Las Palmas real estate. To view more unique Vista Las Palmas homes for sale, register for free. With an account, you'll be able to filter search results, bookmark your favorites, and receive notifications each time promising new Vista Las Palmas real estate enters the market. Vista Las Palmas real estate primarily consists of lovingly restored, iconic Mid-Century style architecture designed by William Krisel. These open rectangular homes feature exteriors made up of brick, wooden panels, or decorative concrete finishes which often come in the vibrant colors that are so well known and loved in the Palm Springs region. Adding architectural depth to these designs, homes can be found with low-gable, folded plate, or butterfly designed roofs, giving each home a unique character. These Modernist homes enjoy seamless indoor/outdoor spaces that lend to the casual lifestyles typically enjoyed by Vista Las Palmas residents. Open your sliding glass wall to the backyard to create a flow while entertaining friends and family on lazy, sunny afternoons. Most homes in this neighborhood have carefully-designed additions that reflect the integrity of the original architecture. Vista Las Palmas not only has one of the more unique curb appeals in the Palm Springs region, there is so much more to this community. Residents here take on a variety of initiatives, raising money to benefit organizations such as the Desert Feeding Program, the Palm Springs Animal Shelter, the Palm Springs High School Scholarship Program, and the Palm Springs Art Museum. The greater Palm Springs area has become popular with young families over the years for its city conveniences and small-town living atmosphere. This area sits nearby the San Jacinto Mountains, resulting in a desirable climate that's cooler in the summer months and warmer in the winter than most Southern California areas. This is the kind of area where you'll see families out an evening stroll or socializing with neighbors as evening entertainment. Residents living in Vista Las Palmas enjoy living in their peaceful neighborhood, but have access to all the conveniences and amenities in Palm Springs, which is just a short walk away. Take advantage of the wide variety of shopping, dining, and entertainment options as well as recreational activities such as the Village Racquet Club. For the finest service in Palm Springs real estate, connect with me. As a licensed REALTOR®, I know the Vista Las Palmas real estate market and I can help you find the best home for your lifestyle.